For this week's challenge we continue our celebration of International Women's Day (take a moment, read yesterday's post --there are some wonderful comments about some wonderful women!) 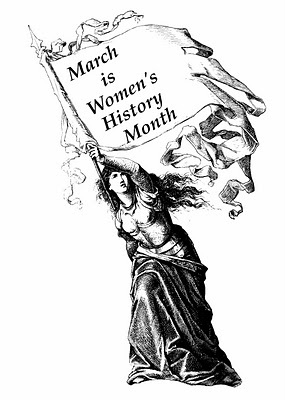 and focus on Women's History Month which is celebrated in March America. 2011's Women's History Month theme is "Our History is our Strength." The National Women's History Project further explains, “Our shared history unites families, communities, and nations. Although women’s history is intertwined with the history shared with men, several factors - social, religious, economic, and biological - have worked to create a unique sphere of women's history.” The Books for Walls Project invites you to share books about women's history! National Women's History Museum for all sorts of goodies, including an online exhibit. Find information and resources at the Library of Congress' Women's History Month website. This year's theme is "Our History is our Strength"
Now, take the Herstory Challenge and tell us about a book whether fiction, non-fiction, poetry, essays, picture books -you name it. Tell us about the book and why a person seeking women's history might want to read it! So many books, how to begin? I will start with one. The Teacher sent me this wonderful play. Its setting is Detroit around the time I was born. The women's voices (joined with men) in the play are my neighbors voices --only I was too young and didn't know. I cried and cried when I finished the book --I wish I had known more, now I will continue the research and learn more about the place and time I grew up. I do remember the women (and men too) in the neighborhood, working so hard to build community and hang onto a vision of a diverse community. In particular I remember collecting donations for block parties --those were amazing times--one year they got the city to bring a pool on wheels that they hooked up to the fire hydrant and filled --that water was COLD. It was a hard neighborhood to live in but the PEOPLE made it worth it, completely worth it. I suggest this short and wonderful play, a very important piece of Detroit's history. Anne of Green Gables and Anne of Avonlea, Lucy Montgomery, All it takes to change your world is a little imagination! "Do you think a little grey fairy will pick up that rainbow and wear it like a scarf?" I know i want to! I hope you'll all enjoy Evelyn Coffey as the Bean and the Mom and Margaret and the Teacher did. Here's a link to one of my favorites of her poem, "The Sentence" which was her defiant response to the doctor's word to her in her youth - that she had to give up dancing because of a weak heart. (She died in her 90's, and every moment was a dance.) http://evelyncoffey.blogspot.com/. Browse her site. Let her cousin know what you think. i love this topic! one of the MOST powerful books i ever read was Calling: Essays on Teaching in the Mother Tongue(1992), by Kalamazoo college professor Gail Griffin. It changed my life - it's about teaching, and academia, and being a woman, and having a voice. LOVE love love this book. "Woman on the Edge of Time" by Marge Piercy (anything by Piercy is full of woman-roaring)A woman from the barrios of New York is trapped in a mental institution and escapes into a utopian future where women and men have torn down every label, status and biological means to keep them seperate. "Ooku: The Inner Chambers" by Fumi Yoshinaga. This is a reverse history about Edo Japan where women are the Shogun lords and men are in scarce supply. I like the 'Royal Diary' series...stretching from Cleopatra to Mary, Queen of Scots! Makes you think and get of an idea about their lives and what kinds of things they had to do.